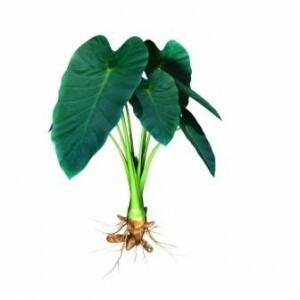 Arbi plants- Colocasia esculenta-OUT OF STOCK TILL SPRING 2019! Also known as Elephants ears, taro, Dasheen(Caribbean), Chembu (Malayalam), kalo (Hawaii). The bulb is consumed by many of the world's peoples. It can be eaten as a starchy vegetable, and the leaves (referred to as Patra in Gujarat) are also eaten as a green vegetable. In some parts of the Caribbean the leaves are referred to as Calalloo, while in other parts it is the leaf of the Amaranthus that bears this name. The Hawaiians make poi with the roots and even feel this plant was the original ancestor of the Hawaiian people. Deep Purplish leaves. How supplied: Plant growing in 2.5" pot.